This blog was originally published on the AYLIEN Text Analysis blog. Finance: Akin Oyedele of Business Insider, who covers market updates. Celebrity: Carly Ledbetter of the Huffington Post, who mainly writes about celebrities. Note: For a more technical, in-depth and interactive representation of this project, check out the Jupyter notebook we created. This includes sample code and more in depth descriptions of our approach. Thankfully parsing our extracted headlines isn’t too difficult. We used the Pattern Library for Python to parse the headlines and generate our parse trees. In total we gathered about 700 article headlines for both journalists using the AYLIEN News API which we then analyzed using Python. If you’d like to give it a go yourself, you can grab the Pickled data files directly from the GitHub repository (link), or by using the data collection notebook we prepared for this project. First we loaded all the headlines for Akin Oyedele, then we created parse trees for all 700 of them, and finally we stored them together with some basic information about the headline in the same Python object. Then using a sequence similarity metric, we compared all of these headlines two by two, to build a similarity matrix. 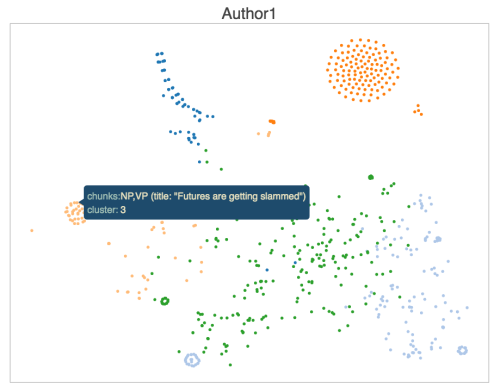 To visualize headline similarities for Akin we generated a 2D scatter plot with the hope of grouping similarly structured headlines close together in a graph in groups of sorts. The large circular group on the top right are mostly announcement-style headlines such as “Here come the…. “ formats. The small green circular group towards the bottom left are similar and use the same phrases we see headlines such as “Industrial production falls more than expected” or “ADP private payrolls rise more than expected”. 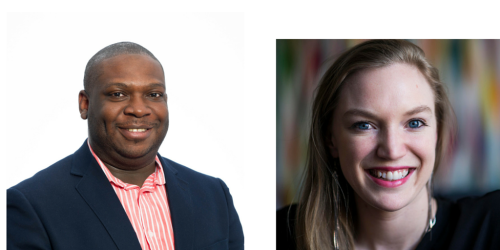 By repeating the process for our second journalist, Carly Ledbetter, we were then able to compare both authors and see how many common patterns exist between the two in terms of how they write their headlines. We observed that roughly 50% (347/700) of the headlines had a similar structure. 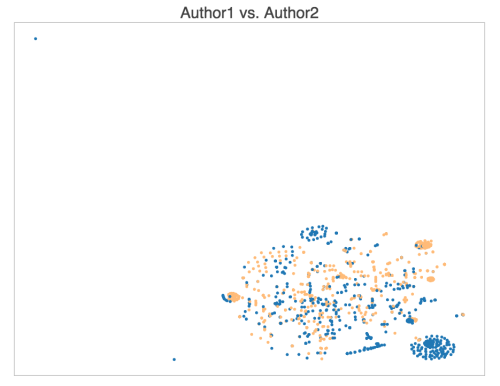 Here we can see the same dense and sparse patterns, as well as groups of points that are somewhat unique to each author, or shared by both authors. The yellow dots represent our Celebrity focused author and the blue our finance guy. The bottom right cluster is almost exclusive to the first author, as it covers the short financial/stock report headlines such as “Here comes CPI”, but it also covers some of the headlines from the first author such as “There’s Another Leonardo DiCaprio Doppelgänger”. Same could be said about the top middle cluster. The top right cluster mostly contains single-verb headlines about celebrities doing things, such as “Kylie Jenner Graces Coachella With Her Peachy Presence” or “Kate Hudson Celebrated Her Birthday With A Few Shirtless Men” but it also includes market report headlines from the first author such as “Oil rig count plunges for 7th straight week”. In this project we’ve shown how you can retrieve and analyze news headlines, evaluate their structure and similarity, and visualize the results on an interactive map. - Better pre-processing to identify and normalize Named Entities, etc. In our next post, we’re going to study the correlations between various headline structures and some external metrics like number of Shares and Likes on Social Media platforms, and see if we can uncover any interesting patterns. We can hazard a guess already that the short, snappy Celebrity style headlines would probably get the most shares and reach on social media, but there’s only one way to find out. If you’d like to access the data used or want to see the sample code we used head over to our Jupyter notebook. There are tons of new models available in the literature. Too many to explore. I find the following tool very good. The authors' made their papers & codes available on the net. 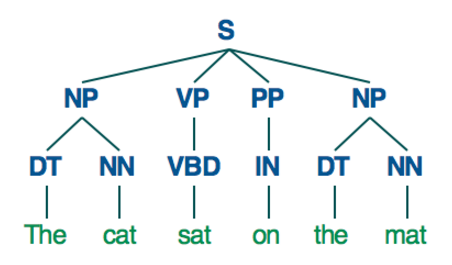 "Latent Trees for Hierarchical Topic Detection"